Longford manager Padraic Davis would be content to do without the Mullinalaghta contingent a little longer if the Leinster champions were to beat Dr Crokes in next weekend's All-Ireland club semi-final. Despite missing a large portion of front rank players through that famous club run and injuries elsewhere, Longford find themselves top of Division 3 after three games, having won two and drawn one so far. The midlanders' defensive stinginess has been especially noteworthy; they've conceded an identical tally (0-09) in all three games. Carlow sat top of the table on points difference at the beginning of the afternoon but Davis's side inflicted a first defeat on their hosts with an impressive five point win in Netwatch Dr Cullen Park. 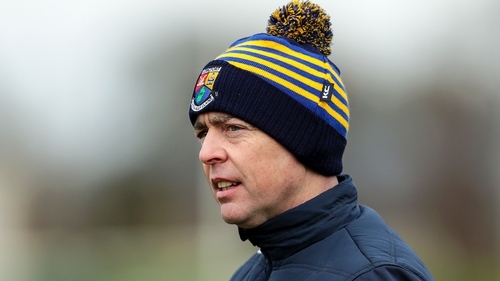 Given the amount of absentees, many had predicted a difficult league campaign for Longford. Early signs are that this hasn't materialised and Davis is happy to go without players from his leading club considering the momentous nature of their challenge next week. "We're looking forward to hooking up with them lads again (Mullinalaghta) but hopefully not too quick," he told RTÉ Sport. "It's an All-Ireland semi-final and we wish them well. We hope that they can cross the line and get to an All-Ireland final which would be a phenomenal achievement really for a Longford club. "In due course, we'll get them (Mullinalaghta players) back. We also have injuries. Padraig McCormack obviously is an outstanding footballer and is still on the bench and we're five or six weeks away from having him. We've a lot of men to come back. So for now, things are positive. "But lookit, we'll move on. We're top of the table and we'll enjoy it for this evening. But at the end of the day we have Down coming up in two weeks and the three games are in the past and it's all about beating Down now." The sides were tied at 0-05 apiece at half-time, a boon for Longford as they had opted to play against the stiff breeze in the first half. The game remain finely balanced in a tentative third quarter but Connor Berry's goal ten minutes from time cracked the contest open and Longford established a four point lead. From there, it was relatively plain sailing. "We decided to go against the wind because of what was on our bench, to be honest. That was a decision we made. "We were very happy with our first half display, albeit they missed a penalty. We got five points on the board and in the end, that was the difference. Into that wind, you could easily go in with nothing or with just one of two points on the board. "The danger was coming out in the second half was that we might think 'the wind will do it for us." It never does. You have to pick up where you left off. And we did that. And Connor Berry just came at the right time and got 1-01 out of him. So it worked at the end. "But Carlow really came at us. And at no stage were we comfortable, apart from those final couple of minutes when we had a five point lead."